Student Senate hasn’t been very visible lately. But Student Senate can own that. Student Senate so often works behind the scenes – scurrying to a meeting, debating a policy, scurrying to another meeting, gathering opinions of students and faculty, scurrying to yet another meeting, advocating for student representation and running to meetings with Bill Born or Jim Brenneman. Sometimes Student Senate is not visible to the students it represents. But Student Senate has been working hard on stuff. Student Senate works on the kind of stuff that affects next week, and the kind of stuff that shapes the experience of the next wave of Goshen College students. If students have any comments or questions, visit www.goshen.edu/senate. Student Senate reads and works on all that comes over across its desk. Drop a line. Remember to leave your name so Student Senate can get back to you. Melissa MacGregor, parliamentarian, on behalf of Student Senate. 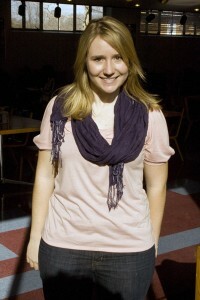 MacGregor is a senior history and investigative skills major from Glen Ellyn, Ill.